The first time I went to Morocco, our tour somehow left off the best Moroccan foods. We ate the same chicken and olive tajine day after day after day. When we left Morocco I didn’t think much of the food at all. To this day my dad refuses to eat Moroccan food. When I went back and stayed with my husband’s family my outlook changed completely. 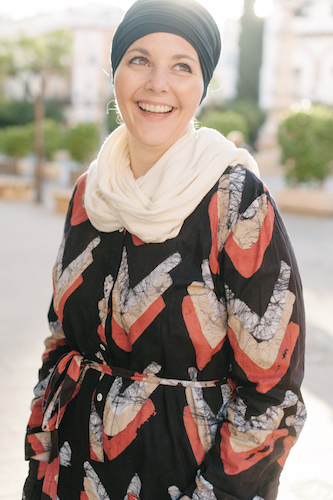 I was showered with the REAL food of Morocco. The flavors were amazing, the dishes complex and delicious. I had no idea it could be so good. To this day, there remains one dish that I consistently say is my favorite – chicken b’stila. I had never tasted something so good before. When I was talking to my mother in law a few weeks ago and asking for soup recipes she rattled off the ingredients for this soup. 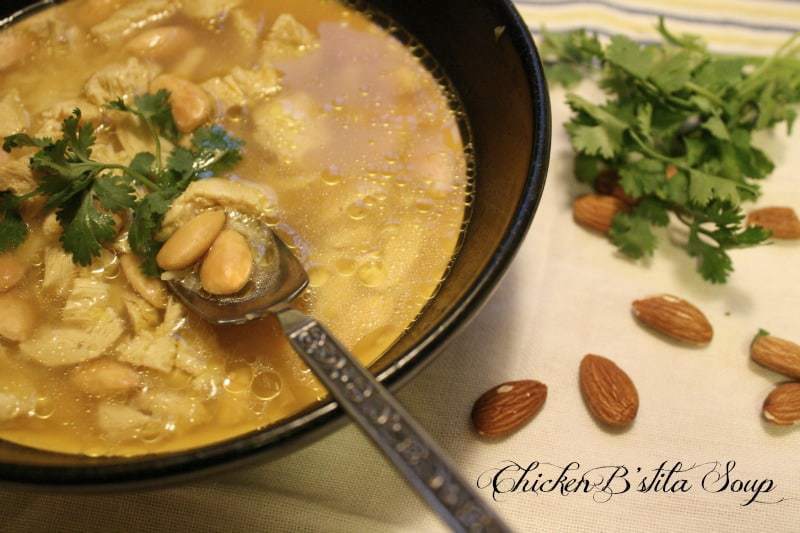 I don’t know if there’s a name for it (I’m guessing they call it chicken soup with almonds!) but I’ve dubbed it chicken b’stila soup because it has the same base flavors, minus the sweetness. 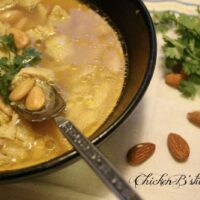 I wouldn’t have thought to add almonds to soup but they add a really nice texture and are certainly unique. The almonds do need to have their skins removed, but with the help of my new videographer (M has taken over taping duties) I’ve made a quick video to show you how. That’s all there is to it! I’ve changed up the original recipe by using chicken breasts instead of a whole chicken and Saffron Road’s Traditional Chicken Broth so that this soup can be a quick weeknight meal instead of an all day process. 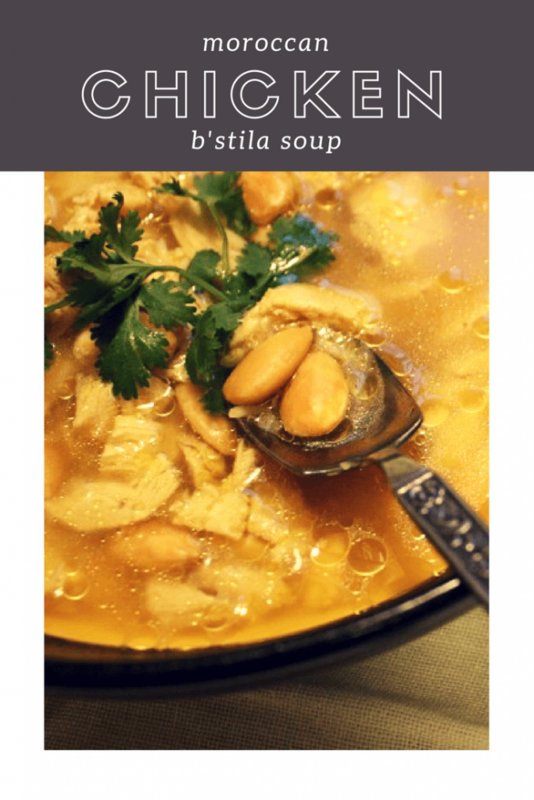 This isn't a traditional recipe but you'll find all the flavors of chicken b'stila incorporated into the soup. In a large pot, add the vegetable oil and butter and heat on medium high. Once the butter has melted add the onions, ginger, salt, pepper, and ginger. Allow to cook for 5 minutes until the onions are translucent. Add the chicken either whole or cut into smaller pieces (smaller pieces will cook faster) and brown on all sides. Add the chicken broth, water, cinnamon stick to the pan and simmer on low to medium heat for 30-45 minutes until the chicken is tender. Remove the chicken and chop into small pieces. Return the chicken to the pot and pour in the rice or noodles and almonds. Simmer 10-15 minutes until noodles or rice are cooked through. What are some of your favorite soup recipes?